For Commercial buildings gaining access to plant rooms and roof tops can be achieved. 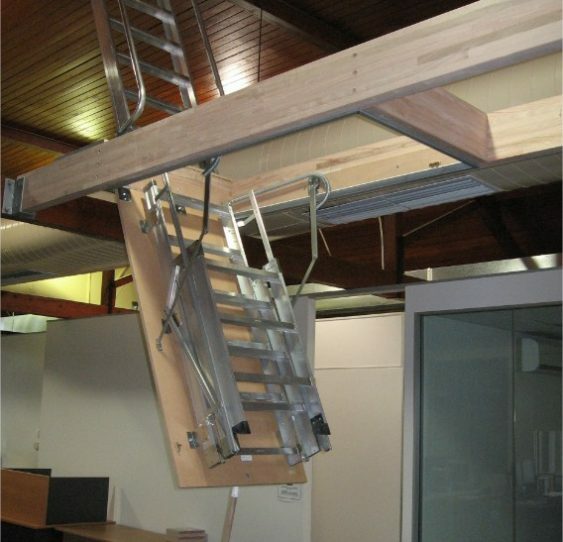 Commercial grade Attic/Attic Ladders provides strong and safe access for a one off cost instead of having to hire plant equipment at a cost instead of having plant equipment at a cost to the owners every time. for roof top access where there is a void in the roof space, a secodary ladder which is fixed in place will give you that access. For roof top access where there is a void in the roof space, a secodary ladder which is fixed in place will give you that access. Combine a Roof Hatch and Aluminium Guarddrail Surrod with Grab rails to complete safe and easy access to the roof . We also supply and install roof top ladders, Aluminuim rung and tread ladders, Caged ladders, guardrails and handrails all made to AS 1657.